Matt Kochanowski, product manager, professional imaging, Epson America, Inc. talked with GISCafe Voice about the latest new wireless printers in the SureColor T-Series with two more models coming out later this year. What are the current SureColor T-Series products? Our SureColor T-Series is made up of the T3270, T5270, T7270 which are all five color wide format inkjet machines. The only difference with the top level products is the maximum width you can print: 24, 36 and 44” printers. Then what we also have is the T5270D and T7270D. These are the same as the single models except these are of a dual configuration. You can either have two different types of rolls in the machine or you can have two different sizes of rolls entered into the machine. Or you can switch back and forth between the two automatically. In the past three or four years, we’ve compacted all the design capability into a small 24” printer. I’m really impressed with what our engineers were able to do. These are for AEC or the GIS mapping community, either for at home or small office use, generating low volume blueprints, drawings, maps. We’re also targeting the education and corporate space, for printing in school posters for education, or for corporate to take any documents and enlarge them, or for printing posters for events that are being planned and promoted within the office. What are the core technologies? One of the biggest core pieces of technology in the printer is the precision PrecisionCore® MicroTFP® printhead technology. This is the same sort of chip technology that goes into business inkjet printers but also into our industrial presses too. One of the main benefits of this head technology, as opposed to previous head technology, is it’s a bigger print chip. What that’s going to translate to is a faster print job. We also have UltraChrome XD2 pigment ink. This is one of the first wide format printers that will have a 4.3” LCD color touchscreen. We worked with one of the leading industrial desiners to design this machine. They specialize in a lot of automotive design and we wanted that same sort of feel, as people feel when seeing a sportscar. We wanted them to feel that way with this printer. We wanted a design that’s attractive and appealing to customers, that they can also incorporate different things into their design along with this printer. Not only that, we wanted to make this a very functional design as well. You can see that it has a flat top surface. Even that 4.3” touchscreen interface can fold completely flat too. After customers print something off the machine, they can take it off the printer, or take their laptop and put it on top of the machine and use that as a workspace. If we’re going to be taking up space on people’s desks and we’re going to have a big printer up there, we want to give some functionality of that space back to them. We made the printer with a small footprint, because it was going to go on people’s desks, and they may not have space for a wide footprint printer. Not only is the printer a small 36” or 24” design, it has an easy set up process. From pulling it out of the box, putting it onto the Desktop and initializing it with the aim of getting it ready to print, the whole process should take less than 30 minutes. This is also a very easy printer to ship to customers. We knew a lot of them were just going to go on Amazon or anyone of our online resellers. We didn’t want to make shipping an issue for them. With the 3170 24” printer, because of the small size, we can actually ship this printer via standard FedEx or UPS Ground. Customers don’t need to worry about special shipping instructions. We took our base design and we migrated it over to a wi-fi format printer. It has easy menu navigation, customers can check supply levels easily, and can also update firmmare directly from the control panel. Another feature we added in is integrated wi-fi, from a Mac or PC, with no need for dedicated cable. You only need a power cable, so you can put it anywhere there’s a power outlet. Having an integrated Direct Wi-Fi connection in the office is great. Many people have their documentation on their smart devices, whether phone, iPad or other tablet, so they can print directly from these devices to the printer, with the wi-fi. The integrated direct wifi connection means they can connect directly to the T-Series printers. They don’t need to go through a router and they don’t need any special apps or software, and they can enlarge or send any kinds of files directly to the printer. The same kind of high quality that Epson is known for in its photo printers is resident in the TSeries. Print resolutions go up to 400dpi for very accurate and very precise line details. For many years, customers have wanted better Nozzle Verification Technology. When we used to run these nozzle checks, ink would fire out of the printhead. Now we can track how close the ink is to the printhead. The film in the printhead is vibrating as it is pushing ink out of the printhead and you can check any abnormality the film is having. It can adjust if something is wrong. If it notices that nozzles aren’t firing properly and detects any abnormality that the film is having, it can automatically move those nozzles over to nearby nozzles. What about archival integrity of inks? The printers have 4-color inkset with high capacity. One of the main benefits of our technology is it is pigment ink based. Customers with high quality photos need to be sure prints are lasting, so they need very archival inks. In the mapping community, people need to make sure maps are not degrading over time. They are also extremely water, and scratch, or smudge resistant. On the job site, our inks extremely durable. With very versatile media handling, the T3170 takes rolls up to 24” wide. With an autosheet feeder, you can have a roll and sheets in the autosheet feeder load at the same time. The T3470 and T5470 are 20-30% faster and larger than desktop models. They are fastest for printing blueprints and maps and have larger ink cartrdiges, lowering the cost of per millletter and the need to replace ink cartridges so often. They are designed for the AEC, GIS, Education industries also. Yet instead of having desktop printers on or nearby, these will be shared by several people in a workgroup. 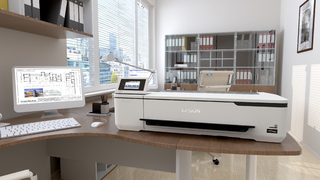 The SureColor T3170 (MSRP $995) and T5170 (MSRP $2,395) will be available in September 2018 and offer a standard Epson PreferredSM Limited Warranty. This entry was posted on Friday, July 20th, 2018 at 11:38 am. You can follow any responses to this entry through the RSS 2.0 feed. You can leave a response, or trackback from your own site.